On June 24, The Institute for Diversity and Ethics in Sport (TIDE) released its evaluation of the NBA in terms of racial and gender hiring practices for executives, referees, announcers, coaches, and players. The league earned a grade of “A+” from TIDE, as 80.5% of players and 43.3% of coaches during the 2013-2014 season were people of color. While the NBA has done a fantastic job in providing opportunities to women and minorities in a once white-male dominated industry, it hasn’t necessarily achieved literal diversity. There are signs suggesting that diversity could be a precious commodity in sports. An analysis of TV viewer demographics in The Atlantic seems to indicate a correlation between players’ and fans’ racial composition; as American sports leagues compete with each other for ratings, having strong player diversity that appeals to a wide array of viewers will translate to enormous gains in TV revenue down the line. So here, I will measure diversity in a more literal way using Simpson’s Index, developed by ecologists to measure biodiversity. 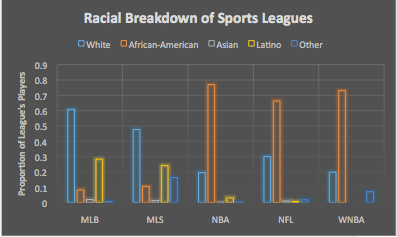 In the context of sports, a league’s diversity score is equal to the probability that two players drawn at random will be of different races or ethnicities. The higher the score, the more diverse a league is. In terms of interpretation, Simpson’s Index is very similar to the USA Today Diversity Index, which has been used to look at racial and ethnic spread across the country. Second to the MLS is the MLB, with an index of 0.542. This is largely driven by the presence of international players from Latin American and Asian countries. The league appears eager to diversify further by recruiting more African-American ballplayers, an effort which is reflected in programs like Reviving Baseball in Inner Cities, or RBI. According to TIDE, African-Americans make up just 8.2% of major league rosters this season. 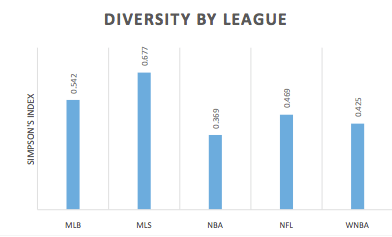 The third and fourth most diverse leagues are the NFL and WNBA, which had Simpson’s Indices of .469 and .425, respectively. Like the NBA, these leagues are dominated by two races. In fact, in the three leagues that Simpson’s Index identifies as the least diverse, over 90% of players fall into two racial categories: Black and White. The ways in which diversity affects sports clubs warrant further exploration. There are indications, though, that it may have beneficial impacts: Recently, a trio of professors found a positive link between winning percentage and linguistic diversity of soccer teams. Whether an analysis of racial diversity would yield similar results may be a topic for future research. You just ignore the existence of the NHL? You include the WNBA and the Soccer League but you leave out the NHL? true, the NHL is a much bigger league than both MLS and WNBA. Pingback: The big question about anthems at sporting events: Why? The NBA should strive for racial parity approximating the general population of the US. Any less goal is hypocrisy. Until then I will not attend or watch a game. I would argue that the 90% doesn’t consist of white and black in consists of white and African American making it even less diverse. White is including the entire world of white people where as African American took the entire world of black and then narrowed it down to one nationality of black. White may not look diverse, but remember it is encompassing every participating nation of white people not just white Americans. what percentage of female players are in the league of america?